Rating: 5 out of 5 - Incredible flavour in a straight-forward recipe. Thank goodness for challenges and blogging events like these. With so many things on my plate (the plate that seems to be on auto-refill - I'm sure everyone knows the feeling! ), it's these challenges that keep me motivated and focused on creating in my kitchen, in order to create on this space. 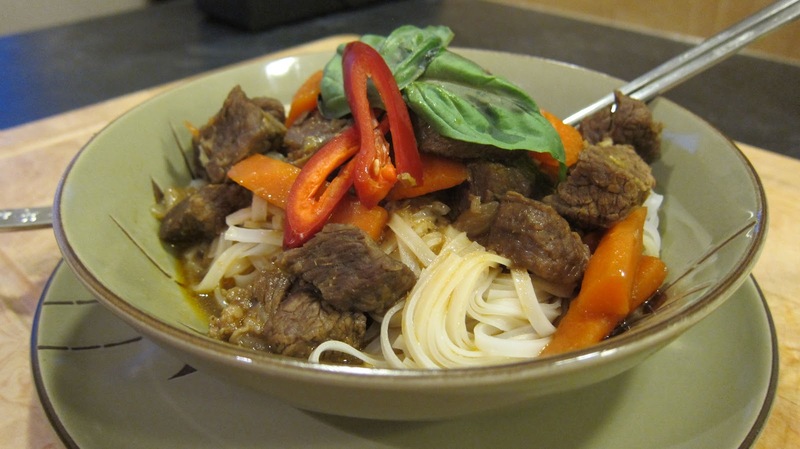 This month's Food & Wine cover challenge, conceived by Jasmine of Cook That Book, features a succulent Asian Beef with Basil recipe. I find the name a little misleading, actually, but only due to the incredible array of flavours going on in this dish. The name seems a little too simple - despite my love of basil! My initial thought was that this dish looked like many other dishes I've made, so while I definitely thought I'd like it, it didn't seem like anything out of the ordinary or new to our kitchen. For a surprisingly lengthy ingredients list, however, the method was still quite straight-forward. 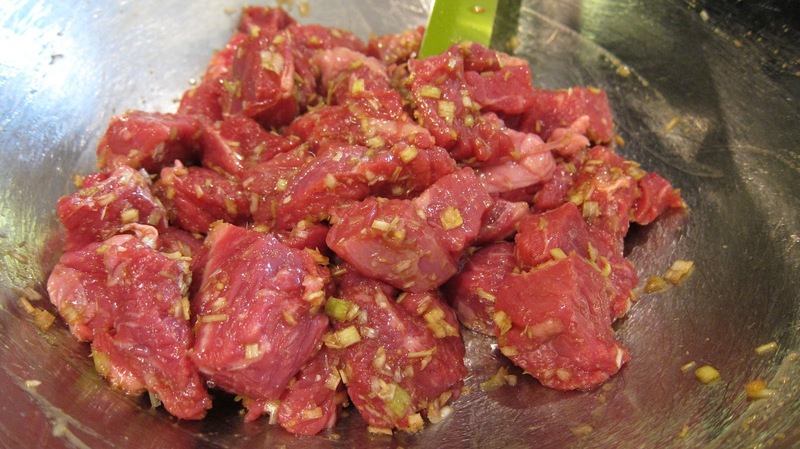 Get a nice cut of beef chuck, let it marinate in the spiced lemongrass and garlic marinade, stew some veggies in a Dutch Oven, add the meat, stew for a while longer, and voilà! 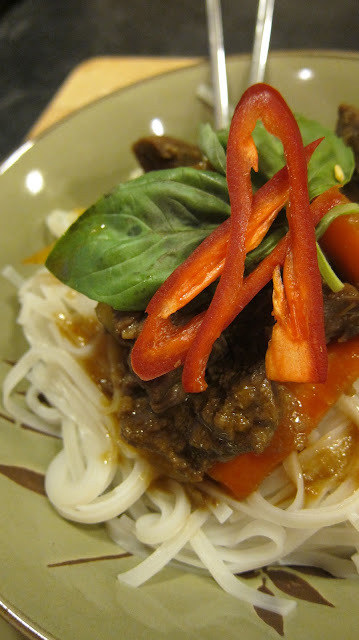 You have a delicious topping for some rice noodles. Admittedly, I only let the beef stew for 45 minutes, and not the 1 hour and 45 minutes the recipe called for. A girl's only got so much time, ya know? So rather than eating at 11pm, I opted to take my chances and finish things off when I did, staving off our long-day-at-work hunger in the process. I can only imagine the dish being that much more tender with the extra time, but honestly, it was amazing as it was: absolutely packed with an incredible depth and breadth of flavour. 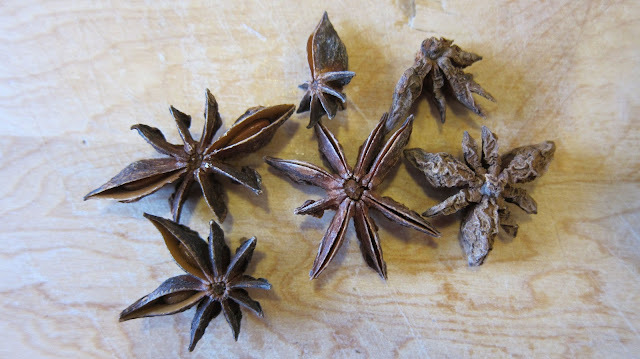 I hadn't worked with much star anise before, either, so it was nice to have the excuse to buy a supply of the stuff for the pantry. Now what to do with the big bag of star anise I have left? Well, at work today, Chef Jess used it while making a plum, raspberry, and strawberry compote. Genius! 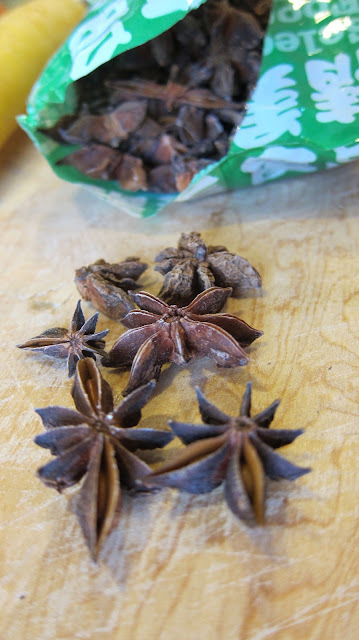 I honestly hadn't thought to ever use it in a sweet or dessert-like way, only savoury and in certain international dishes. What a beautiful scent and flavour it infused into the fruit! Have I ever mentioned my love of basil? Probably. 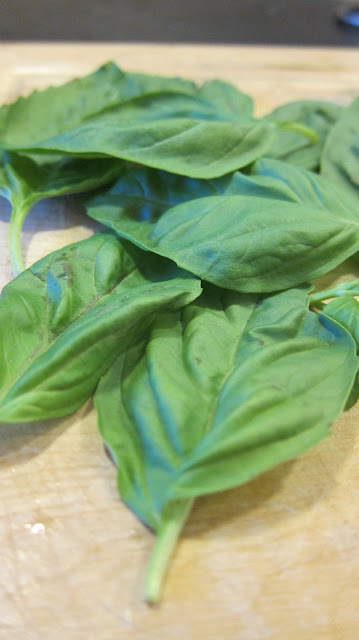 But when I used to live in places where I'd walk to get my groceries, I'd intentionally put my basil purchase in my shoulder bag so that I could smell its wonderful, peppery aroma all the way home. It was an instant mood-enhancer! There are few dishes I make at home that I couldn't sneak some fresh basil into, so when the recipe calls for it, I'm pretty happy to comply. Basil love. A most sincere one. 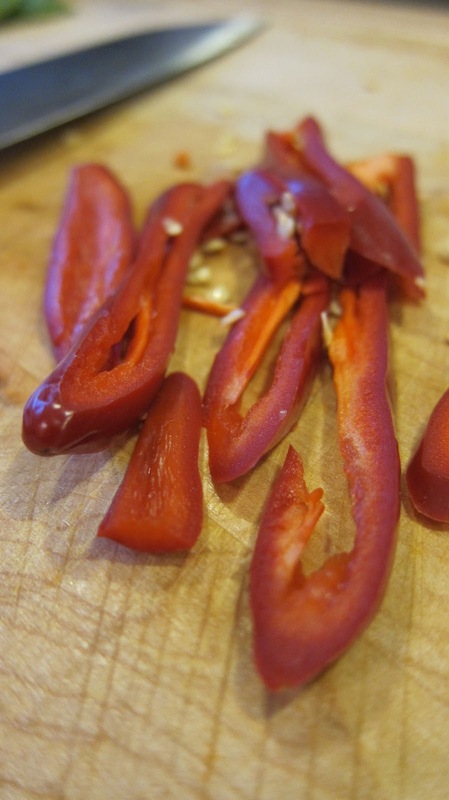 Sadly, I never seem to learn to take my contacts out BEFORE I cut chillies. I'm hopeful that someday I will learn this lesson. It might not look like much - but that flavour!